A dry erase board (or dry-erase board, whiteboard or markerboard) is a clean, convenient surface for keeping temporary lists. 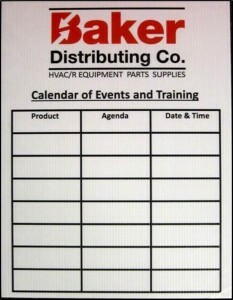 Printed in a custom design, a dry erase print helps you keep track of sales, work projects, or even grocery shopping. We’ll help you lay out your board plan, we’ll print it in sharp, bright lines and colors on a stout, stiff backing, and then apply a clear, permanent dry erase surface. Our printed boards erase clean no matter how long you leave the writing in place or what color of dry erase marker you use. Most commercial dry erase boards, or whiteboards are completely white with no lines or text. These boards have a coating of highly-crosslinked polymer that can be marked by dry-erase inks, but resists penetration and long-term marking. The ink stays on the surface, and can be wiped off. To achieve the same effect on a printed, lined surface we first print the text and lines on heavy-duty vinyl, or on a white-coated hardboard surface that will accept printing ink. Next we apply over the printed surface a transparent layer of dry-erase polymer. This polymer, like the surface of a whiteboard, can be marked by dry-erase inks, but not permanently marked. Dry-erase marker inks stays on the surface, and can be easily wiped off without leaving a stain. To finally get a dry erase board up to your specifications, call us at 816-459-7552, or email us at print@streamlinekc.com.